the highest quality herbal products. A company is only as good as the products it sells, which is why we only sell the very best. 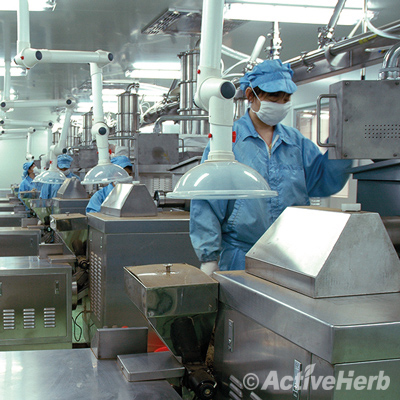 Our commitment to quality and safety has helped ActiveHerb become one of the most trusted Chinese medicine companies in America. The commitment to providing our customers with the safest and most effective Chinese herbs available is no small task. Here’s how we work together with scientists, herbalists, and manufacturers to keep that promise. The first, and most crucial step in preparing Chinese herbal medicine is verifying that all the herbs being used are safe for consumption. In the past, some Chinese herbal supplements have been reported to cause damages to the body. A major cause of such damages is the existence of harmful substances in certain herbs. For example, aristolochic acid is a component of the Chinese herb Guan Mu Tong, which was used by some manufacturers to make the Chinese herbal medicine Long Dan Xie Gan Wan before its detrimental effect on the Kidneys was found. As we know, Guan Mu Tong is not the only herb that contains aristolochic acid, and aristolochic acid is not the only toxic substance found in herbs. Therefore, a deep scientific knowledge is necessary to exclude the use of the herbs that contain aristolochic acid or any other harmful constituent. At ActiveHerb, every herb has been carefully evaluated for its safety by our experts before it can be used in our product lines. comprehensive set of lab tests before it reaches consumers. Procurement of premium quality Chinese herbs is the foundation of making quality Chinese medicine. The quality of Chinese herbs available in the market varies greatly, depending on many factors, including indigenous soils, growing practices, harvesting techniques, and in some instances, counterfeit and adulteration by unscrupulous merchants. 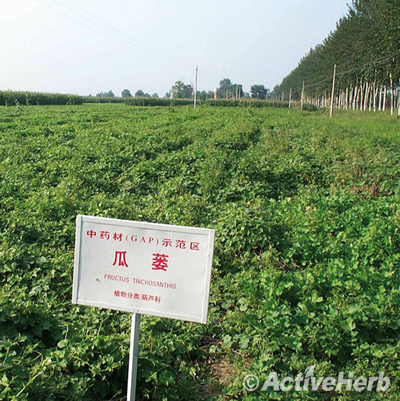 That is why ActiveHerb chooses to partner with only the most respected herbal medicine manufacturers in China. We insist on purchasing high quality Chinese herbs that meet our requirement for authenticity, quality grade, potency, and safety, no matter what higher purchase prices we have to pay. As many herbs look alike, authentication is needed to ensure the correct species is purchased. Identity tests done by our experienced herbalists include basic organoleptic, microscopy, and Thin Layer Chromatography (TLC), adhering to the official PRC Pharmacopoeia and other recognized references. Some Chinese herbs need to be properly processed before use to achieve the desired medicinal properties or to eliminate toxicity, which is also a topic of quality assurance. Quality control measures at this stage include testing of active ingredients using High Performance Liquid Chromatography (HPLC) to ensure potency, and testing of pollutants like heavy metals to ensure purity. All of our herbal supplements are manufactured in strict compliance with Good Manufacturing Practices (GMP) in both China and America. 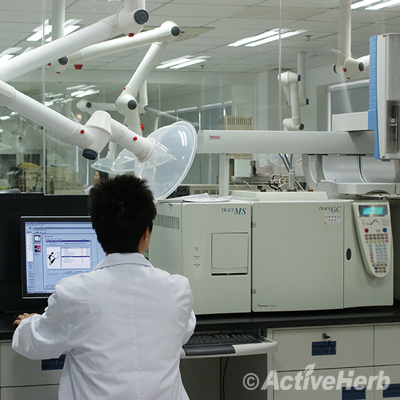 The facilities of our Chinese partners are cGMP-certified for pharmaceutical products. cGMP refers to the Current Good Manufacturing Practice regulations enforced by the US Food and Drug Administration (FDA) cGMP dictates standards for everything from facility cleanliness, employee training, process documentation, and more to ensure proper design, monitoring, and control of manufacturing processes and facilities. cGMP also includes standards for process transparency and traceability to quickly track down anomalies and answer regulator inquiries on demand. This high level of scrutiny and care results in a product that is handled safely and hygienically. These standards are in place through every step of the process, starting from herb procurement, all the way to the finished product. We deploy our proprietary technology in the manufacturing of our extraordinarily concentrated herbal products. Each product has its own product specifications that cover its manufacturing protocol and quality control parameters. Our quality control standards meet and often exceed those set forth in the Pharmacopoeia of the People’s Republic of China and the US Pharmacopoeia (USP) for similar products. 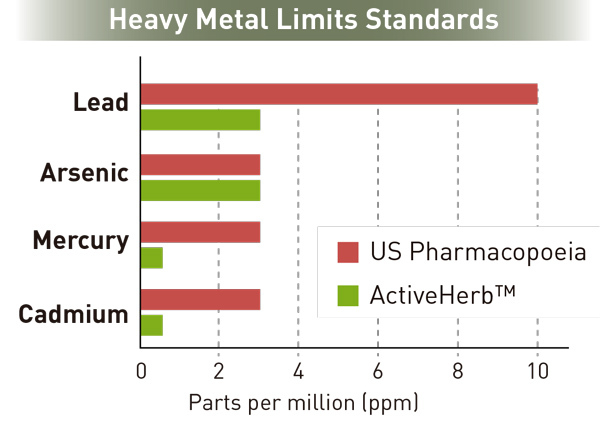 For example, safe heavy metal levels set in USP for botanical drugs are 10 ppm (parts per million) for Lead, 3 ppm for Arsenic, Mercury, and Cadmium respectively. Our rigorous quality control procedures allow us to keep our heavy metal limits below 3 ppm for Lead and Arsenic, 0.5 ppm for Mercury and Cadmium. Extensive laboratory tests are carried throughout the manufacturing process to ensure such quality standards are met. Testing is done both in our state-of-the-art quality control center and 3rd party laboratories. Upon finishing, each and every batch of products is subject to a complete set of tests for safety, purity and consistency. These tests include physical examination on the appearance and uniformity, moisture content, weight consistency, disintegration time, heavy metals, and microbial loads. Tests for active ingredients and pesticides are also performed as necessary. Only the finished batches that meet all the specifications are accepted to our warehouse. Our Certificate of Analysis, offered with each product, attests to the safety and purity of our products.